If you’re interested in hearing about my goals for 2018, skip ahead! Does anyone really do that much in January? For me, this month was spent working on some very exciting non-Umbraco challenges. Despite founding the Umbraco London meetup, Cogworks hosted Umbraco London for the first time in about 3 years this February… Since joining the company I had been wondering why we didn’t host the meetup anymore, which lead to me step up and make one happen! I presented a talk on our “Package Development Story” — discussing Cogworks’ process behind building successful packages such as “Find And Replace” as well as something new… The package I had in the works for a few months “Meganav” was revealed to the world here on this day! Meganav was launched on March 1. To date it has close to 3000 downloads across Our Umbraco and NuGet. It’s lovely to see your hard work turn into something people use and find useful. I also attended my first uWestFest in Denver, CO during March — it was great to meet the US Umbraco community and hear their ideas. I’d love to go to another Umbraco US Festival again in the near future. 2017 was a year of a few firsts for me, starting with speaking at UmbCardiff in April! Myself and a colleague Ismail Mayat were going to be in the area so I got in touch with the UmbCardiff team and asked if they’d like us to come along and present something. They kindly accepted so I spoke about Umbraco Packages and Ismail spoke about training. Another first, Yoyo Design started up an Umbraco Kent Meetup in Tunbridge Wells. As this is a short train ride from London I suggested I could come along and present something for their inaugural meetup. I spoke about “Inherited project horrors”, sharing some of the experiences we at Cogworks have had when inheriting Umbraco projects, code smells that can be found, and how best to deal with them. CodeGarden is always a blast and this year was no exception. Deadly chilli vodka shots were passed around the Umbraco HQ during the pre-party, Niels and Per dressed as Donald Trump and Theresa May for Bingo Night, and a car was flipped over! It was super interesting to hear from Stephan, who has been leading the development of Umbraco v8, about what’s coming up as well as hearing about the fantastic work the community are doing. I came away refreshed and filled with ideas! To wrap off a packed first half of 2017 I gave my “Inherited project horrors” talk at the Umbraco Poland meetup in Krakow, alongside my colleague Marcin Zajkowski who shared what went down at CodeGarden. I came up with the idea of hosting an Umbraco BBQ — I call it an Umbraco MEATup. Generally meetups don’t run as frequently over the summer as people are away, so I saw this as the perfect time to bring the community together for a social event. I started by organising an event Bristol, being one of the biggest Umbraco communities in the UK, which was a great success — I’ll definitely be doing more of these in 2018! I submitted my first pull request for Our Umbraco, adding a “Master” badge to user profiles for those who had achieved a Master certification status. The PR also included a mechanism to assign badges remotely so the badges could be automatically assigned when someone completed their training. I had made countless PRs to the Umbraco Core before but never to Our Umbraco, so this was a new experience. Community veterans such as Lee Kelleher gave some pointers on how to get started which was a massive help — H5YR! My first ever Skrift article on “How an Umbraco Festival is Born” was released at the end of July, giving an insight into what goes into putting on a world-class Umbraco event in the Umbraco UK Festival. 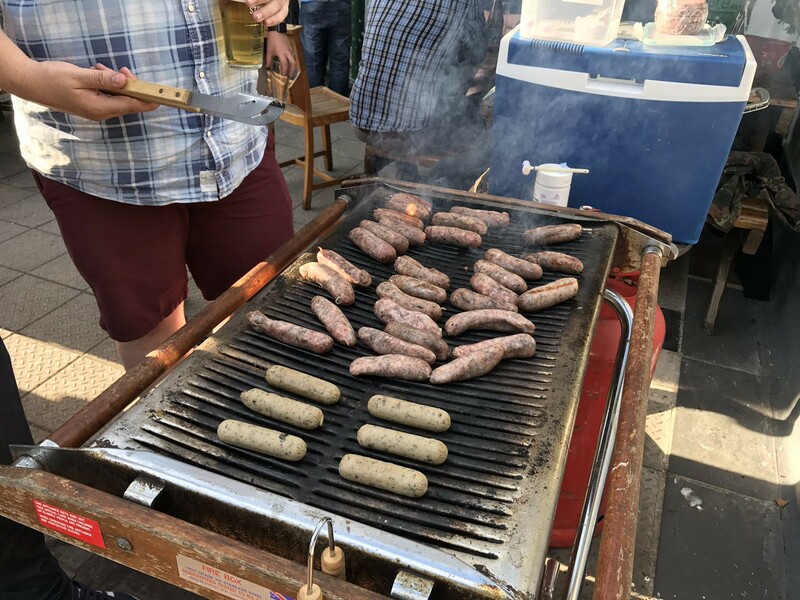 August saw the return of the Umbraco BBQ, this time in London! The event had to be postponed by a few weeks due to the British weather, but it turned out another success in the end with over 20 people attending. Watch out for more BBQs coming in 2018! I visited the Umbraco Kent meetup again to discuss the variety of hosting options that are available for Umbraco sites for a range of needs (small or large setups, security conscious organisations, etc). For the week of September 10–15, team Cogworks descended on Krakow in Poland for our 2nd Umbraco Poland Festival! I returned to London feeling not-so-fresh due to a week of heavy drinking… but armed with some great ideas. My 2nd ever Skrift article was released during their October newsletter, sharing “What to Expect at the UK Fest”. The Umbraco UK Festival is in November each year and preparation starts in around January. As organiser, the Festival was pretty much all I could think about for the last few months of 2017 and most of October was spent juggling a million different things to ensure we put on the best Umbraco Festival people have been to. The Exeter .NET meetup was the only non-Umbraco meetup I spoke at this year, though I did talk about it… I was invited to introduce the Umbraco CMS to a broad group of .NET developers, most of whom had never heard of it (shocking, I know?!). I presented “Building an Umbraco site in 30 minutes” where I setup a site on Umbraco Cloud and explained all of the key features of the CMS from a newbie’s perspective, against the clock. I managed to fit in some social activities towards the end of the month by going bowling with the UmBristol crew. Easily the biggest month of 2017 for me; November involved the Umbraco UK Festival, speaking at 2 meetups, and the launch of UmbraCoffee. After months of working, the day of the Umbraco UK Festival finally came around. 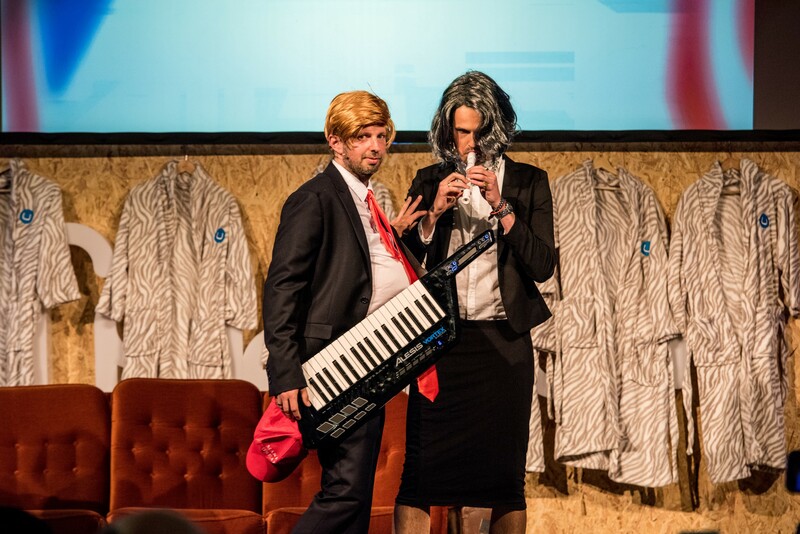 In my opinion this was easily the craziest and most enjoyable Umbraco Festival of the year — though I am biased... It was great seeing the community enjoy what myself and the rest of the team had put together, and the feedback we received was brilliant — the challenge is now to do even better in 2018! 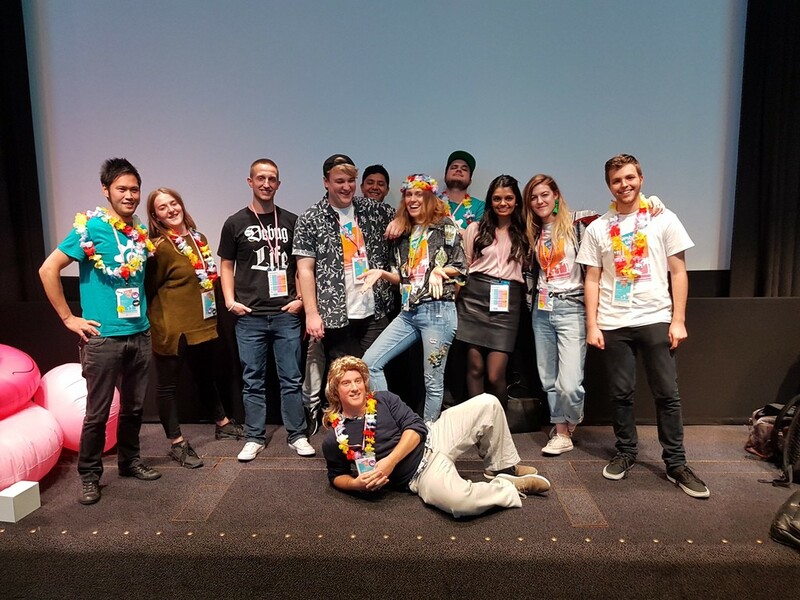 Being our 8th event and with Umbraco v8 on the horizon, we went for a full out 80’s / Miami Vice theme complete with bright flower garlands, dodgy floral shirts, and inflatable pink flamingos which certainly added to the energy of the day. I visited the Umbraco Dorset meetup for the first time, kindly hosted by Cold Banana Studio in Bournemouth, to fill them in on what they missed out on at UK Fest. This was one of the best meetups I’ve attended in a while — the community in Dorset is super friendly and eager to learn. There was even a banana controlled Snake game in the Cold Banana Studio office! Finally, I launched a new YouTube series with my colleague Marcin: UmbraCoffee. Every Friday at 11:30 we go LIVE on YouTube with a chosen guest and discuss what’s happened this week in Umbraco over a hot drink. We like to think of it as a uHangouts 2.0. Our first episode was on November 24 and we have gone LIVE every Friday since, including a Christmas special with Rune Hem Strand from Umbraco HQ where we reviewed Umbraco’s 2017. In 2017 I focused a lot on my own personal projects, but I feel like it’s time to give a bit more back to the open source projects I love (Umbraco, packages, JS libraries, etc). For 2018 I’ve set myself the challenge of making at least 1 open source contribution per week (or 52 over the year). I feel like this gives me time to plan which contributions I’d like to make, and I should be able to find a little bit of time to dedicate to different projects. I’ve even setup a website so I can track my progress and outline my plans — 52prs.com — in the hope someone else will be inspired to join me on the challenge too! 2017 was packed with meetups and conferences, but it would be great to travel and meet new people in different Umbraco communities around the world. I throughly enjoy speaking at Umbraco events as it gets me out of my comfort zone, builds my confidence, and allows me to meet with smart people from all over the world. 3. Engage with the Umbraco community even more! Meet more people, more BBQs, more blogging. And with that… I would like to wish everyone in the Umbraco community family all the success and happiness for 2018. H5YR!